Looking for best ant killer? Read this reviews of the 5 best ant killer products on the market now to choose your best one. Dealing with ants may not necessarily create panic, but it can be a never-ending battle that becomes exhausting. Having the best ant killer is sure to give you peace of mind as you tackle this issue. Deciding to purchase spray pesticides or baits can be a confusing decision. By following this simple guide, you’ll have the knowledge you need to win the war against those little soldiers. 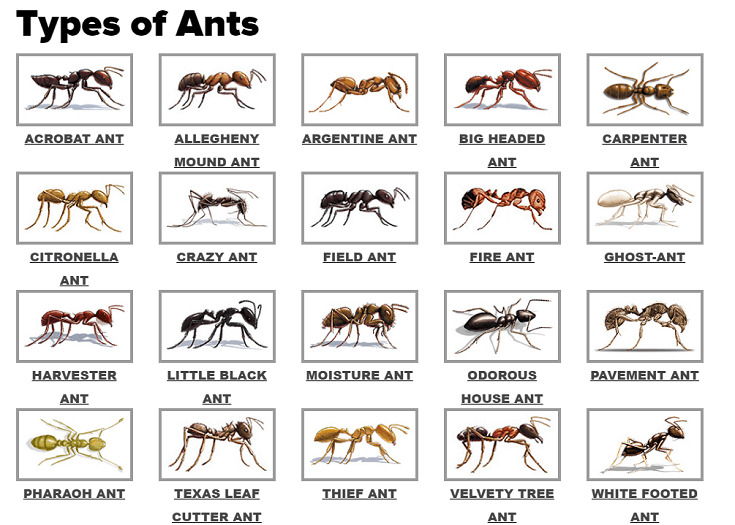 When faced with a decision of finding the best ant killer for your home, there are several options to choose from. Some products are more effective at dealing with the ants you can see, while other products go directly after the source of the ant problem. Many times you are facing an ant issue and you don’t even see them. That’s because ants love to hide in cabinets, behind appliances and walls. They also lurk beneath floors and inside door frames. That can make it difficult to find the ant problem and eradicate it. This is a great time to use liquid baits. They are effective indoors or outdoors and will attract many varieties of foraging household ants. Once the ants have consumed the bait, their digestive system will carry the poison back to the nest. There, the queen and other ant family members will die once the poison has been fed to them by the carrier ant. Thankfully, baits are pre-packaged inside plastic. They house all the insecticide and attractant within the unit making them a great option when children or pets are around. Using aerosol ant sprays can help to deal with a seasonal ant infestation. Mainly, this option works best on ants that are visible. This option is a temporary solution and doesn’t tend to impact the nest. In addition to the immediate results, the spray will also provide residual effects for up to four weeks. Using a spray is the best ant killer for the kitchen when you need them gone fast. It will also work well to keep ants from coming back to areas like the trash can. Keep in mind that many sprays contain chemical products which create fumes. Always spray in a ventilated area and keep your pets and children away. With a syringe, it is easy to apply a gel around the house where the ants enter. They are also effective when applied to the ant’s track around your property. Using a gel for pest control issues allows for a cleaner application. There are even some syringe applications that are childproof with a safety control attached for protection. To target the ant’s nest while protecting the home, granular ant baits provide a fantastic solution. Many of these are slow acting and naturally occurring biodegradable fungus which ants love to eat. Then, the ants will carry the bait back to their home and kill the entire nest. This process can take just 24 hours. Many granular ant baits target a specific type. 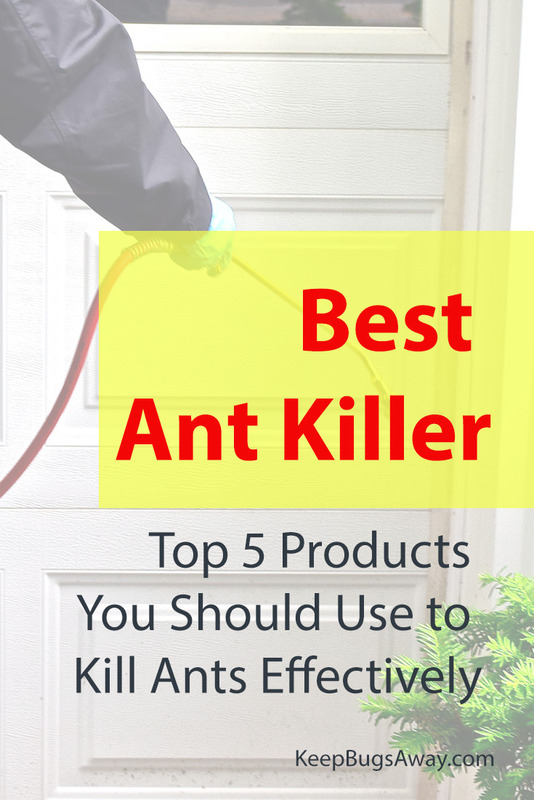 Here are the 5 best ant killer products you should know about. 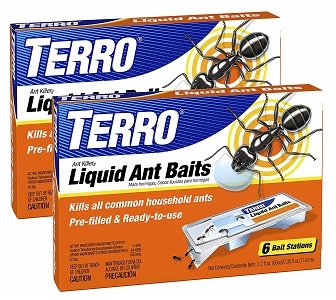 Easily rated as the best ant killer for indoors, use TERRO T300 Liquid Ant Baits to kill most common household ants. The ready-to-use bait stations are pre-filled and couldn’t be any simpler to apply. Simply place the bait near an ant trail. For best results, you’ll want to use all six of the baits supplied in the box. Then, the ants will enter into the trap and consume the liquid bait. When they return to the nest, they will share the bait with their entire colony. Usually, there is a two to three-day time frame before the bait kills the ant. Because of this, there is plenty of time for the foraging ants to share with the unsuspecting colony. Six Bait stations provide an adequate supply of materials to last up to several weeks. Each box contains the six baits that you need, which make for a superior value. If you need more than the six baits, it is available to purchase in a double or triple pack as well. Keep in mind that this product works by having the ants carry the poison back to the colony. Because of this, you will most likely see a surge of ants coming to the bait at first due to the attraction of the bait. One customer was proud to announce that with this product they were winning the ant war. Another customer was happy to relate the bait to a kegger for ants. Advion is a broad spectrum product. This means it will control various ant species, specifically sweet feeders. In fact, Advion claims that this gel attracts up to 19 different species. 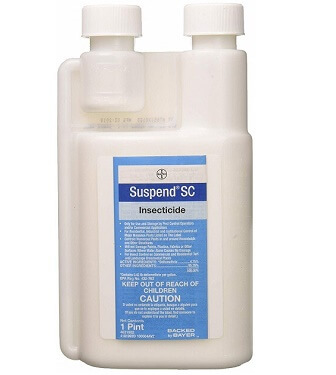 The insecticide provides a high attractant, homogenous formulation. 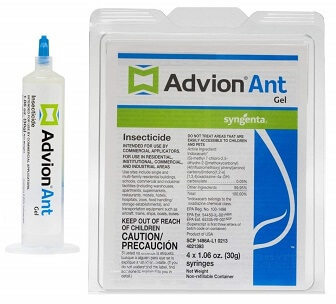 This brand easily impacts all life stages of the ant so you achieve complete colony control. Advion is completely odorless to humans. When it comes to the ants, however, they are extremely attracted to the sweet bait. Within a few hours, you can see hundreds of ants swarming the baits. Wait longer and there will be even more. The hardest part about using this bait is remembering not to clean up the dead ants right away. The dead ants also serve as a bait to attract more ants and are a vital step to ridding yourself of an infestation. While I believe this product is extremely powerful and effective against killing ants, I am personally not sold on the higher price tag. There are plenty of other effective products that simply don’t cost this much. Another Terro product tops the charts, but this time as the best ant killer for yards! The biggest difference between this and my top pick is that the outdoor version is ideal for large ant infestations. It works in basically the same way. The pre-filled ant bait stations come ready-to-use. Simply place them outdoors where you notice the ants. You can use the stakes provided to secure the baits. Ants will sense the bait and ingest it. Then, they carry it back to their colony, and most importantly the queen, and share the poison with them. This isn’t just the best ant killer for the yard, but can also be used some places indoors. You could consider using them in garages, on decks or down in the basements as well. 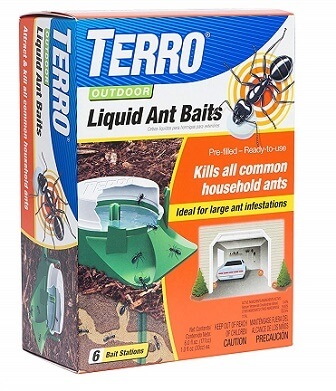 The Terro outdoor baits are effective against all common household ants. Best of all, the baits are waterproof which prevents the liquid from drying out. This box also contains six baits just like the indoor version. With this formulation, however, you can purchase them in bulk up to six boxes of six baits at a time. Buying in bulk makes this a great value if you need more baits. It is easy to see why you would want more because this is the best ant killer for lawns. I’ve seen that I am not the only person who thinks this is an amazing product. Reviews have flooded in with one person exclaiming on how quickly the product worked. Another noted that despite the fact that hundreds of ants crowded around the bait to eat, within a short timeframe, all the ants were gone. When looking for a more natural product to use, Orange Guard provides a fantastic option. The ready to use formulation offers a broad range insecticide that is made from orange peel extract. It not only kills bugs that are hidden, but it also works on a variety of pests. 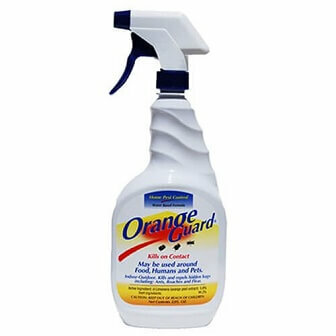 Orange Guard is effective against roaches, fleas and ants as well. Because of the natural formulation involved with this spray, you can use this around food, pets and humans alike. It is a water-based spray. Use this pest control solution indoors or outdoors, wherever your infestation is occurring. For naturally-conscious consumers, it is pleasing to know that it is also EPA-registered. Currently, it is available to purchase in a 32oz bottle, but you can save money by buying two bottles at a time. It is a little pricier than many products, but worth the extra if you want a natural-based remedy. Keep in mind that this is a spray which will kill bugs immediately. The downside to this is that it won’t make it back to the nest. The customers who currently use this formula had nothing but great things to say about the usage. Many praised the fact that it was safe for kids and pets while others talked about how fast it killed everything immediately. Sometimes the only product that will work is the one that pest control companies will use. That’s when you’ll want Suspend SC Insecticide. One pint of this formulation makes up to 64 gallons of solution. This can vary depending what pest you are attempting to target. This is safe to use indoors or outdoors. In addition, use around food handling areas is okay as well. The broad-spectrum control offers solutions to more than 50 pests you face. There is no odor or visible residue that will be left behind. This is rated as one of the best fire ant killers for lawns, as well as other species of ants as well. Use this solution on porous surfaces with ease. In addition, it can last up to 3 months after application. For the best application, you’ll want to use with a sprayer. That allows for easy application on landscape ornaments, in restaurants and more. The only option for sizing is a 1-pint bottle and the price tag is hefty. Keep in mind that the 1-pint can easily turn into 64 gallons depending what insect you are targeting. A fan of Suspend noted that despite using other products before, nothing compared to this brand. Another user exclaimed that in spite of the fact that they only spray outdoors, there have been no more insects within the house either. After deciding on the best ant killer for your needs, it would be important to determine why you should use it. Consequently, you’ll also need the best application tips to ensure proper termination. While most ants are not dangerous to humans, they could in theory still carry bacteria. Organisms like E.coli, Salmonella and Streptococcus have been found in some species of ants. If the home is dealing with an infestation of carpenter ants, the wood in the house is not safe. Carpenter ants are capable of damaging any wood where they nest. This causes costly destruction to a home and can also create many unnecessary headaches. According to the Combat website, there are seven main types of ants that you could be battling against. 4 common species found in the U.S.
6 known species in the U.S.
Red Imported Fire Ant is the worst, found mainly in the southern U.S.
Found in most of the U.S.
Nest under pavement slabs found in foundations, sidewalks and driveways. Here are some questions to ask yourself before making a purchase. What type of product will work best for me? This is the guiding force behind the product you ultimately decide on. How much will I need to complete the necessary application? You don’t want to start applying the ant killer around your house only to run out of the product. What is my budget? Certainly, there are options for every budget available. Many times the more expensive options will be more powerful, but if you can’t afford it, there are other avenues you can take. What type of ant am I trying to kill? Some products work best on a particular ant and you’ll want to be careful you choose only the best for your circumstances. Some products can be used on multiple insects. Products used outdoors should not interfere with your water supply and don’t remain in the soil for longer periods of time. Always follow the directions given on the package you are using. On top of that, here are some helpful tips you can follow when trying to get rid of ants. Learn about the entire colony and the Queen’s habitat. Follow the ants to understand more about the colony and where they are coming from. Don’t spray the ants if possible as this only kills worker ants which doesn’t solve your problem. Set out a bait which will make it back to the queen via the worker ants. This has been found to be the best ant killer for indoor spaces. Don’t clean while using the bait. Mopping up the floor is going to eliminate odor trail which will lead the ants to your bait. Have patience. It can take several weeks for a colony to die, especially if it is large. Spray outdoor nests. If trailing the insects takes you to an outdoor nest, by all means, spray insecticide directly on it. This might be the best ant killer for the outdoor space that you have. Maintain a clean home to prevent future infestations. Seal off any areas of the house where ants can come in. It is plain to see why the best ant killer available right now is the TERRO T300 Liquid Ant Baits. With high recommendations and the utmost in effectiveness, it is super to help win the ant war at your house. It is the best value of money compared to all other brands. In addition, there is very little effort needed to take control of your home again. Don’t hire professionals to do what you can do yourself. Save yourself some money and unnecessary time. Simply choose the best ant killer and you’ll be on your way to an ant-free home again. Enjoyed Top 5 Products You Should Use to Kill Ants Effectively? Share it with your friends so they too can choose the best ant killer.